Medal of the Order of the Black Eagle, with the motto "SUUM CUIQUE" in the center. "Suum cuique" (Classical Latin pronunciation: [ˈsu.um ˈkuj.kʷe]), or "Unicuique suum", is a Latin phrase often translated as "to each his own" or "may all get their due". It has been significant in the history of philosophy and as a motto. The Latin phrase relates to an old Greek principle of justice which translates literally into English as "to each his own". Plato, in Republic, offers the provisional definition that "justice is when everyone minds his own business, and refrains from meddling in others' affairs" (Greek: "...τὸ τὰ αὑτοῦ πράττειν καὶ μὴ πολυπραγμονεῖν δικαιοσύνη ἐστί...", 4.433a). Everyone should do according to his abilities and capabilities, to serve the country and the society as a whole. Also, everyone should receive "his own" (e.g., rights) and not be deprived of "his own" (e.g., property) (433e). "Iustitia suum cuique distribuit." ("Justice renders to everyone his due.") – De Natura Deorum, III, 38. [...] ut fortitudo in laboribus periculisque cernatur, [...], iustitia in suo cuique tribuendo." (" [...] so that fortitude (courage) may be seen in hardship and danger, [...], justice in attributing to each his own".) – De Finibus Bonorum et Malorum, liber V, 67. 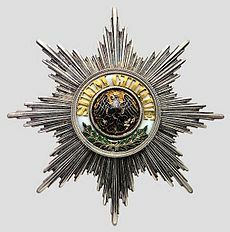 Suum cuique serves as the motto of the Order of the Black Eagle (German: Hoher Orden vom Schwarzen Adler; founded in 1701), the highest order of chivalry of the Kingdom of Prussia. The motto continues in use in Germany – in the insignia of the military police (the Feldjäger) and in association with the Berlin-based Masonic Lodge, Black Eagle Lodge (German: Johannisloge Zum schwarzen Adler). The Faculty of Advocates in Scotland uses the motto Suum cuique. The phrase also serves as the motto of the Faculties of Law at Lund University and Uppsala University in Sweden, Faculty of Law at University of Warsaw in Poland, as well as the Faculty of Law of Federal University of Bahia in Brazil. Valentin Pikul's 1985 novel on the career of the French General Jean Victor Moreau (1763-1813), Kazhdomu svoyo, uses as its title a Russian-language version of suum cuique. Snow, one of the characters in Stanislaw Lem's influential science fiction novel Solaris, uses the phrase when discussing the 'visitors' with Kelvin. The powerviolence band Nails has one song named "Suum Cuique" in the album Abandon All Life, released in 2013. This is the last song of the album and was the longest song (with 5:21 minutes) during their years of career. Jedem das Seine ("To each his own"), a German translation of the phrase. It became notorious for its use as a Nazi slogan displayed at the gate of Buchenwald concentration camp. ^ "Wir über uns". Johannis-Loge – Zum schwarzen Adler – Freimaurer Berlin (in German). Johannis-Loge. 2013. Retrieved 2016-07-22. Suum Cuique [...] Die Gründer unserer Loge haben sowohl den Namen unserer Loge als auch ihr Logenabzeichen, das so genannte Bijou und unser Siegel, dem alten preußischen 'Hohen Orden vom Schwarzen Adler' nachempfunden. [...] Der Wahlspruch des Ordens lautete 'suum cuique' lat. für 'Jedem das seine' und bedeutet soviel wie Recht und Gerechtigkeit üben und jedem das Seine zu geben.[...] Dies ist auch unser Anspruch und der Leitgedanke der unsere Arbeit bestimmen soll.